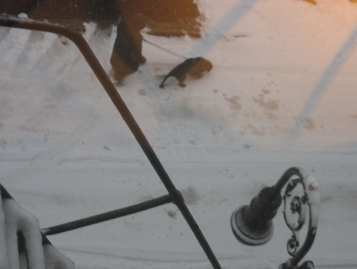 The price of dog ownership is walking the dog in a snowstorm. It’s snowing right now, as I type, (7:51am) and I was trying to get a picture of it, when this guy came by, walking his dog. He gets to have a dog, but he must PAY. I am thoroughly exhausted and I’m going to take a holiday today, but I’m tired from a great day yesterday. I got up at 4am to go to down to Quantico to interview some guys at the FBI about audio forensics (thank you, FBI!!). It was the kind of day where I am stunned at the luck of my life. I get to go to the FBI to interview people involved with some of the coolest work. And they couldn’t have been nicer. At one point I was staring and staring at an old wire recorder and they noticed me staring and they pulled it down and opened it so I could get a better look. But more about them in my piece! (I’m still working on it, I’ve got more interviews and editing to do. We’re shooting for sometime in March, but it could be April.) I also get to hang out with Art, the producer I work with at NPR (and everyone is great at NPR, smart and nice). So then, I’m waiting for the train to come home and Howard Dean walks by, waiting for the train just like me, and then the guy sitting next to me on the train turns out to be my agent’s publisher (my agent writes books, too) and he knows my editor, and we end up gabbing the whole way home. I should have to pay for a day like that, and I probably will, but today I’m going to relax. Actually, maybe I will work on line edits for my book. I’m at the fun part now. When I’m editing, sometimes I just can’t get something right so I literally leave notes in those spots for myself in boldface that say [make better] and move on. When I’m done I go back to all those parts. All the heavy lifting is done, so it’s a pleasure. That’s where I’m at now. Man! You had some kind of wonderful going on yesterday. Makes me want to rub your head for luck or something. Re: the dog thing: I’ve never minded having to take dogs out in the snow — in fact, there have been times when it’s exhilerating to be out at night under a full moon; but having a dog like Daisy, who refuses to walk on crunchy, frozen stuff is a real pain! Pointing out that her brother, Buddy, romps with abandon over this same terrain does not shame her into sallying forth. Fortunately, she has an amazing capacity to hold it. The Princess and the pee. How cool are you going to Quantico!!!! Nicole was thinking at one point of wanting to work for the FBI I sure she would love to hear about your trip next time she sees you. Karen, I’d be happy to tell her all about it. The place is HUGE.